Scrutiny of the Minister for Finance by Janet Finch-Saunders, Assembly Member for Aberconwy, has unearthed the fact that almost £8million has been spent by the Welsh Government on purchasing and repairing vehicles and vessels during the last three financial years. Responding to the finding, the Member has criticised the expenditure, and asked for a review of all purchases and repairs so to be sure that tax payers’ money has been spent wisely. “I am passionate about ensuring that every single penny is spent carefully and invested in the right place. “The Welsh Government has a history of making questionable investments in vehicles, such as the fleet of ministerial limousines. Indeed, I have disclosed previously that these have on occasion been used to carry papers, not persons, and know for a fact that some Ministers continue to use taxis and trains. “Another example of eye-opening expenditure is the £2.6million spent on a replacement to the vessel worth around £40,000 in Conwy Marina. “Clearly, the Welsh Government does need to invest in vehicles so to assist its operation and undertake some legal responsibilities, however, serious questions have to be asked as to why almost £8million has been spent on repairing and buying new motors in the last three financial years. This is quite perplexing as when most of us buy a car, we tend to make the most of it and keep it going for as long as possible. We economise, so I hope that the Welsh Government is doing the same too. “It is true that the expenditure was brought down to £1,211m last year, but this is still a huge amount. Therefore, I have now responded to the Minister for Finance asking for a review of all purchases and repairs so to be sure that tax payers’ money has been spent wisely. “There is no room for waste, especially when our local authorities, health service, and schools are in such a perilous financial state”. 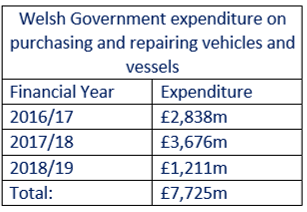 How much money has the Welsh Government invested in purchasing and repairing vehicles and vessels in 2016/17, 2017/18, 2018/19 separately? Further to WAQ78116 will the Minister provide a breakdown of the expenditure for each of the three financial years, and state whether she will undertake a review of all purchases and repairs so to be explain why every investment was necessary?